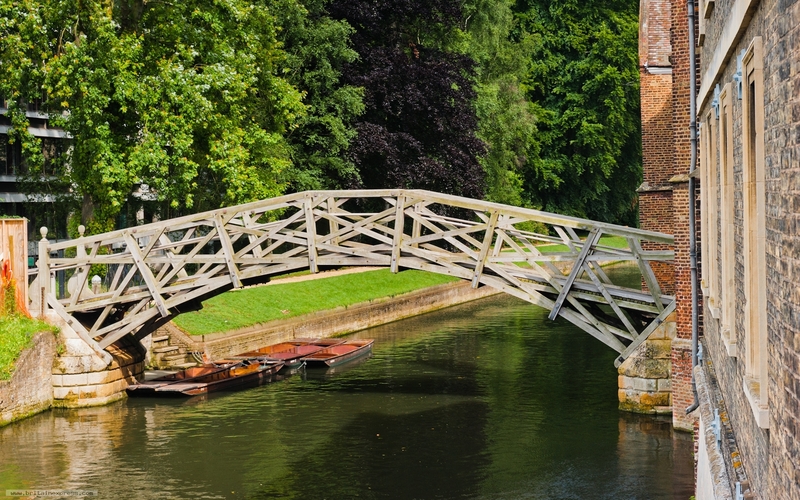 The actual name of this bridge linking two parts of Queen's College across the River Cam is simply 'Wooden Bridge'. That's not nearly as romantic as its more popular name, Mathematical Bridge. What we see today is the third version of a bridge designed in 1749 by William Etheridge. Tradition says that the bridge was designed by Sir Isaac Newton, but Newton died some two decades before the Mathematical Bridge was erected. Tradition is also wrong when it comes to the bridge's construction; it was supposedly built without nuts, bolts, or pins, but in fact the joints have always been held together, first by spikes, now by nuts and bolts. The best place to view the Mathematical Bridge is from Silver Street Bridge, a stone's throw to the south.